Fall 2017 I enrolled in a class that develops transistors over the course of a semester. 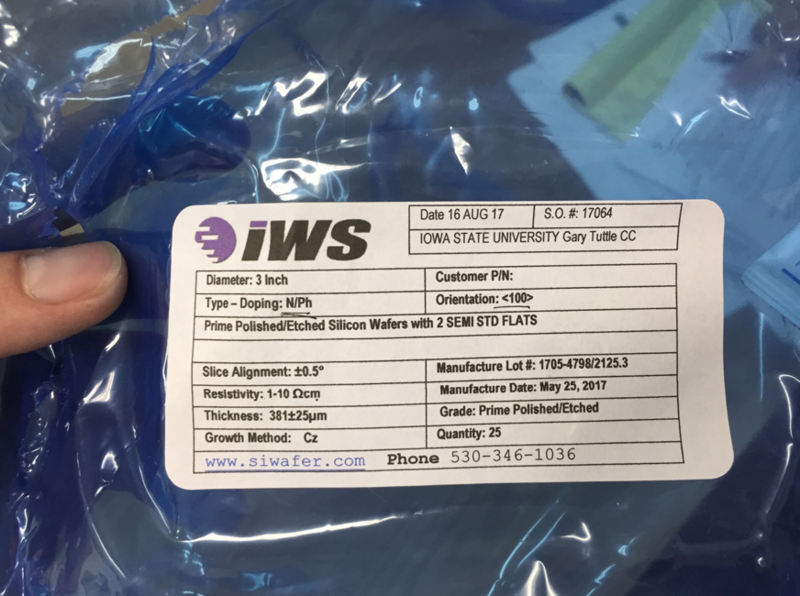 We are using 3inch wafers and each die contains a series of NMOS, PMOS, BJT, and logic transistor circuitry. This page will describe the steps and processes underwent to produce. We will be using Boron for our p-type doping. We will be using Phosphorous for our n-type doping. Most of our process can be broken down into 4 main steps that get repeated to produce the end result. Our Lab group started with a total of 8 n-type doped wafers from the lot 1705-479812125.3. 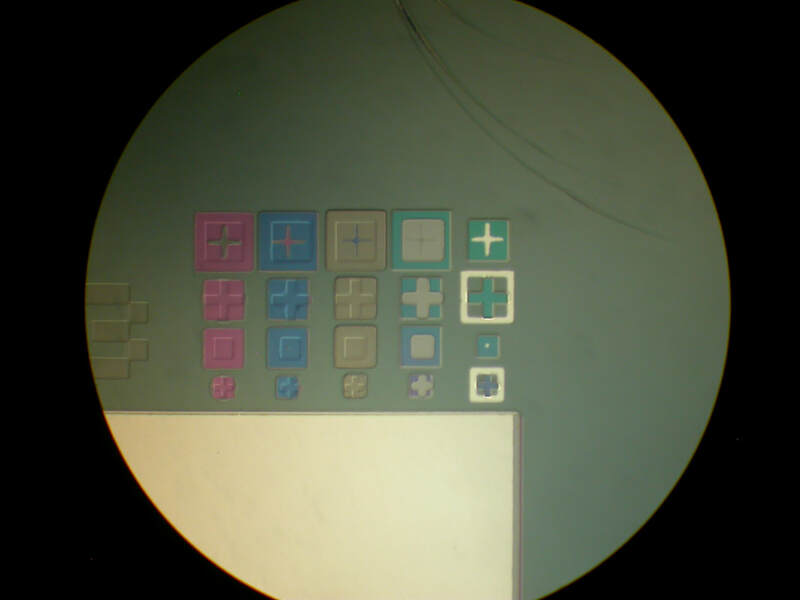 Four of them are used as device wafers and 4 as test wafers. Doping level of the wafers used was 5E16 cm^-3. The resistivity of each wafer had a value of 1-10 Ωm. The dimensions of each wafer are 4.3-inch diameter, and a thickness of 381 + 25um. Each SC solution is then heated to 80˚C. The wafers are then placed in SC-1 for 15 min. This step removes any organic impurities and particles off the wafers surface. This is followed by a cascade rinse which is just water that is agitated with nitrogen to rinse the wafers. The cascade rinse lasts for 3 min. This leads to the second step which is a HF dip. The wafers are placed in the 50:1 HF solution for 15 seconds. This is followed by a cascade rinse for 1 min. The third step is to place the wafers in SC-2 for 15 min. Lastly this is followed by a cascade rise for 3 min and a spin/dry cycle. 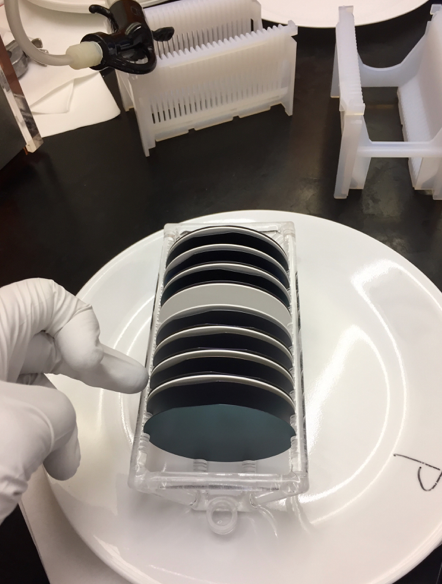 The wafers are now clean and ready to perform the next processing step. The first step is to bring tube #3 of the furnace to “standby” state which is defined as T= 800˚C, Ambient gas flow=1.0 slpm dry N2. Place wafers in cooled quartz boat for tube #3 and transfer the boat to the mouth of the furnace (good side facing far end of tube). Using a push rod slowly push the boat into the center of the furnace at a rate of 1 inch every 12 seconds. 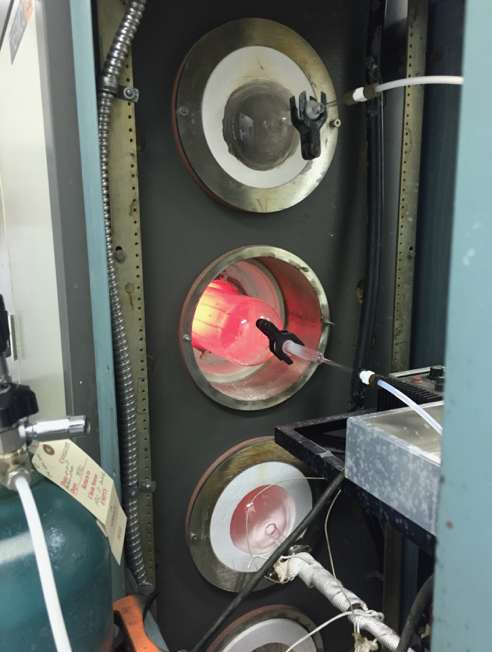 Now you will need to ramp up the temperature to our desired oxidation temperature of 1100˚C, this took 10 min to accomplish. After that turn fill bubbler with fresh DI water, set the switch to vent so nitrogen gas can flow through at 200 sccm, and power up the bubbler to 98˚C. When the tube temp has steeled make sure bubbler is at 98˚C. Turn off the dry N2 gas flow and flip the vent bypass switch to send the nitrogen and steam mixture into the furnace tube to start oxidation. Begin timing. Our calculated oxidation time was 14m and 20s. Once this time was up the bubbler was turned off and a ramp down sequence began. This consisted of leaving the furnace at 800˚C for 1 night. The wafers were then removed at a rate of 1 inch every 12 seconds. 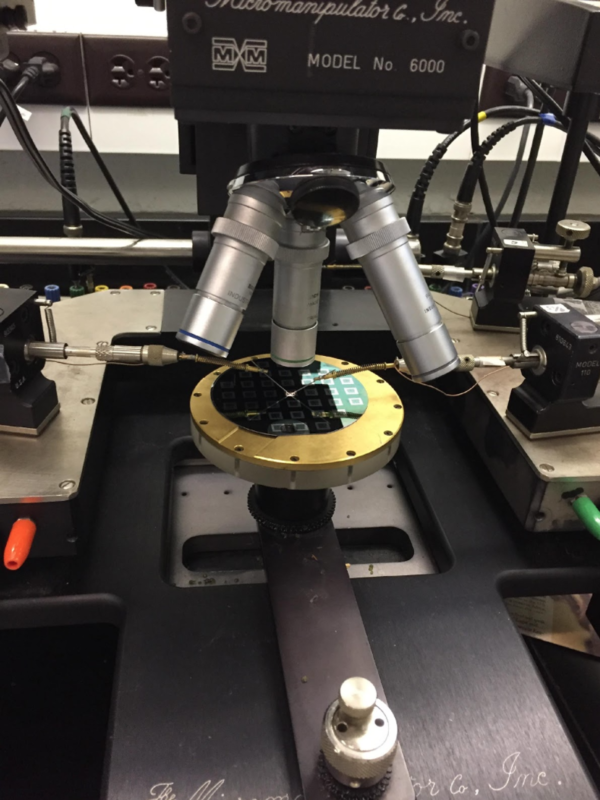 The final step was to measure the test wafers thickness using Filmetrics. 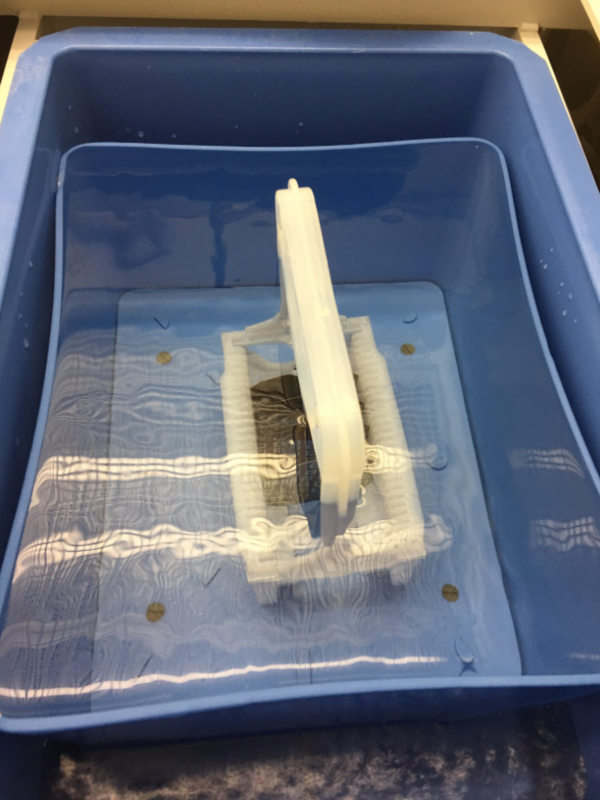 Each wafer received 4 measurements and the average was taken to get a oxide thickness. On the right shows the tool to calculate the time needed for wet oxidation. To grow 0.25um of oxide it will talk at least 12.27 min. 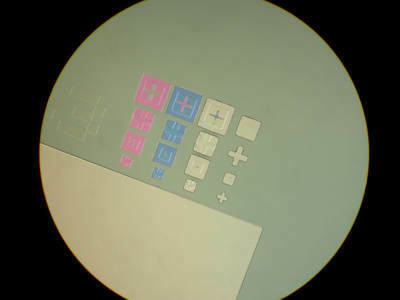 Photo lithography is used to pattern your wafer. 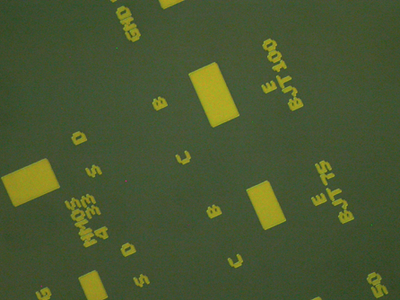 We are using positive photoresist which means that the exposed areas will become soluble and able to be removed. The purpose of doing this step is to create a mask on top of the wafer for the following oxide etching step. Center the wafer on the spinner chuck. 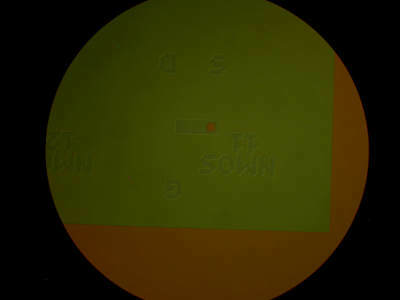 Apply 6 drops of HMDS (adhesion promoter) to the center of the wafer and spin at 4000 rpm for 25 seconds. After that apply 2 half tubes of positive photoresist to the center of the wafer and spin at 4000 rpm for 40 seconds. After the chemicals are applied place the wafer on the hot plate for a prebake at 95˚C for 1 minute. Repeat this process for the remaining wafers. 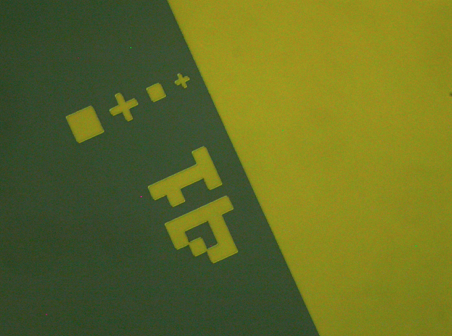 The next step is to expose the photoresist under UV light. This is done by using the contact mask aligners. Since this is the first exposure no alignment is needed. The wafer is positioned on the tray with the flat side facing you and development side facing up. Once inserted into the machine, check the wafer is positioned in the center while in separation mode. Finally lift the lever to put into contact mode. Now it is time to expose the mask onto the photoresist so press the exposure button. For this exposure we exposed the wafer for 120 seconds. After this is done take the wafer out by separating and fulling out tray. This final step is to remove the exposed regions of photoresist and is done using a developing agent. This agent dissolves the soluble exposed photoresist areas on the wafer. 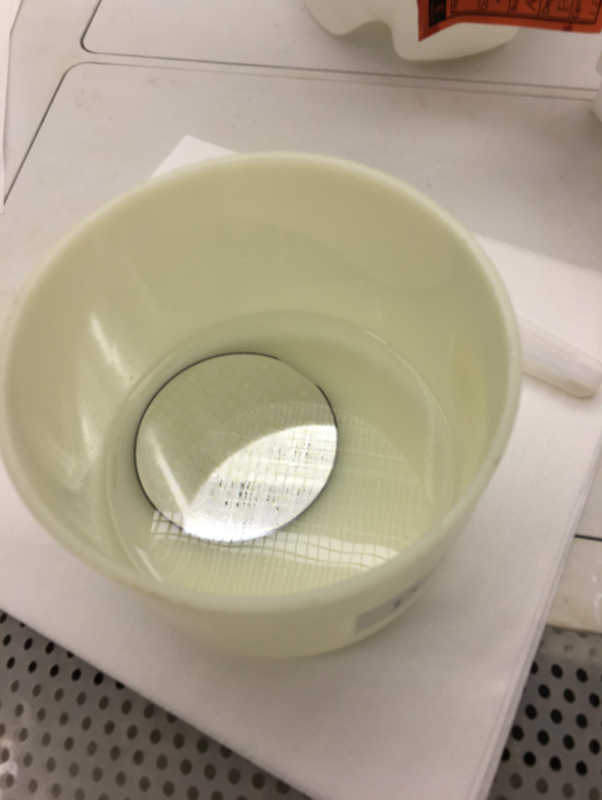 Place the wafer in the dish with MIF-300 developer for 60 seconds and agitate by swirling container. After that remove the wafer and place in a cascade rinse for 3 min. Dry using the nitrogen spray nozzle and inspect to see in development appears. The last step is to perform a post bake on the hotplate for 1 minute at 120˚C. We found to etch 247.7nm it would take 2.527 min which is 151.66 sec. Knowing this we created our BOE solution and set the wafer tray in for 151.66 seconds. The wafers are then placed in a cascade rise for 2 min. To tell if you etched all the way down you can check by seeing if the water sticks to TW1 when removed from the cascade rise. If you are all the way down water won’t stick because photoresist and silicon are hydrophobic meaning water is repelled. We found that our TW1 had water sticking to it meaning we did not fully etch; a rule of thumb is to place back in BOE for 10 sec intervals until you reach the silicon. It took our TW1 another 10 seconds and we finally reached the silicon. The last step is to remove all the photoresist. This is done by Dipping the wafer carriage into Acetone #1 for 2 minutes and the Acetone #2 for 3 minutes. After that the carriage is dipped into Methanol for 1 minuet followed by a cascade rise for 2 minuets. The last step is to do a dry cycle in the drier to dry the wafers. The purpose of Boron Deposition and Drive into the removed region of SiO2 is to create a p-well. A p-well is an area in the n-type substrate that is turned to p-type. Initial step before starting is to do a standard clean for the wafers. Separate wafers on the boat with the solid source boron wafers. As shown in the figure below. Heat furnace to 850˚C. Place the boat into the mouth of the furnace and push in using push rod at a rate of 1 inch every 12 seconds. Leave for 20 min. Open the oxygen gas cylinder valve and set the flow rate to 1 slpm. And decrease the nitrogen flow to 1 slpm. Next open the hydrogen valve and regulator valve. Adjust hydrogen flow to 40 sscm and let if flow for 2 minutes at 850˚C then shut it off. Close the cylinder and regulator valves. This is the step was done by out TA but the work done to do the drive is as follows. The first step is to again do a standard clean on all the wafers. Next ramp up the furnace to 800˚C and an ambient nitrogen flow of 1 slpm. Start the bubbler by first filling it with fresh DI water. Turn the vent on the steam control to vent. Next start the nitrogen gas sloe through the bubbler by setting the stich to Manual and setting the nitrogen gas flow into the bubbler at 200 sccm. Lastly turn on the power to the bubbler and set the display temp to 98˚C. Wait for the furnace to reach 800˚C. Using the push rod slowly push the boat into the center of the furnace at a rate of 1 inch every 12 seconds. This step is the low temperature oxidation. Turn off the dry N2 flow and flip the vent bypass switch to tube and begin timing. This process is 30 minuets in duration. Next turn off the bubbler and unload by pulling at a rate of 1 inch every 12 seconds with an ambient nitrogen flow of 1 slpm. After they are out Preform the Deglase by placing the wafers in BOE for 30 seconds followed by a cascade rinse for 3 minuets and a dry cycle. Push them back into the furnace on the boat at a rate of 1 inch every 12 seconds with an ambient nitrogen flow of 1 slpm. Once there turn off the nitrogen gas and flip the vent bypass to send the nitrogen and steam into the furnace tube to start oxidation. Begin timing and time for 8 min for the oxidation to finish. At the end of this period turn off the bubbler power and shut off the flow of nitrogen to the bubbler. 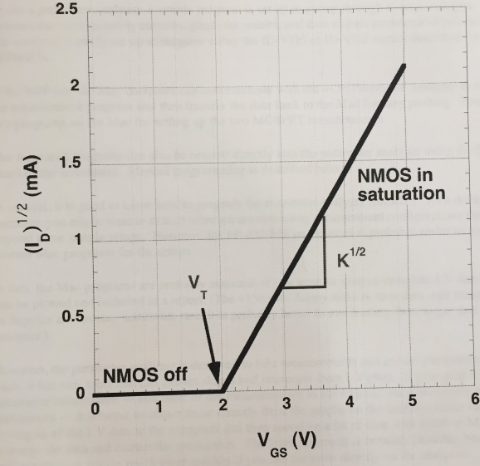 Turn the flow of nitrogen in the tube down to 1 slpm. Leave the boat in the furnace at a temperature of 1125˚C for 16 hours for the drive to take place. The last step is to ramp down the furnace to 800˚C and we left it here overnight to cool. After that the wafers were pulled out of the furnace at a rate of 1 inch every 12 seconds. Oxide thickness after growing field oxide. Oxide thickness after p-well drive. 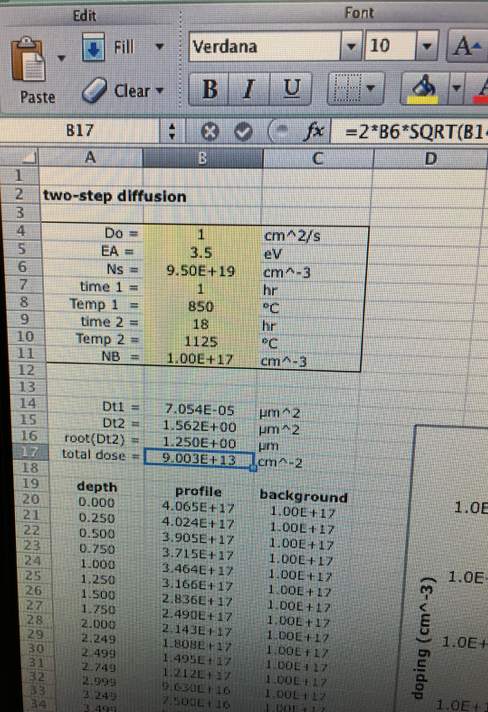 Our results on the readings for the oxide thicknesses after the initial field oxide growth as well as after the P-well drive. It can be observed that the thickness has increased substantially. Also, above can be seen the images taken after the first lithography. The outlines of features can be seen in each image. Since this was the initial exposure no alignment needed to be done. From now on we will have to match with the alignment markers. 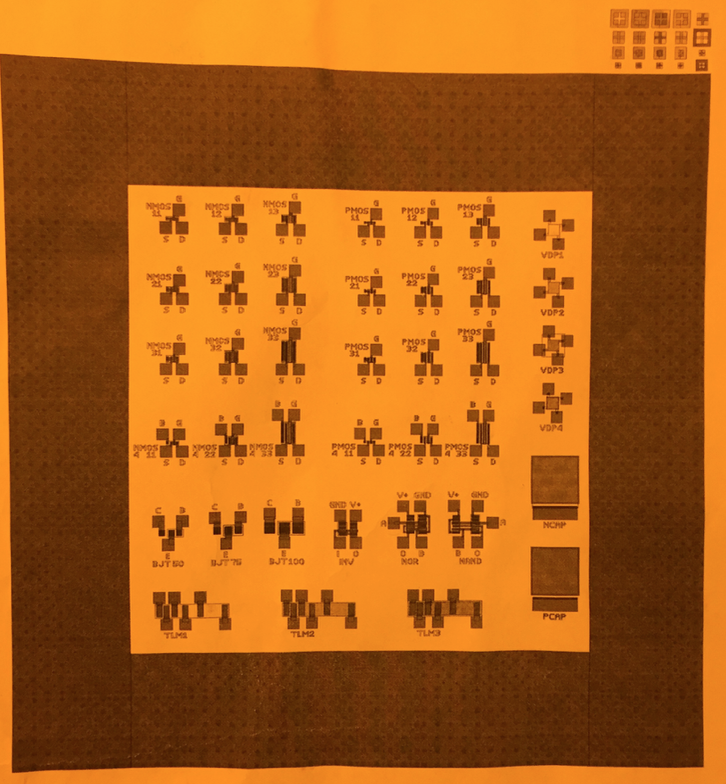 Each die contains a total of 39 devices. The devices are laid out on a grid for ease of numbering. The 3-terminal and 4-terminal transistors in the top left area of the die are number by row and column. The other devices are lined up on the grid on the bottom and right edges of the die. 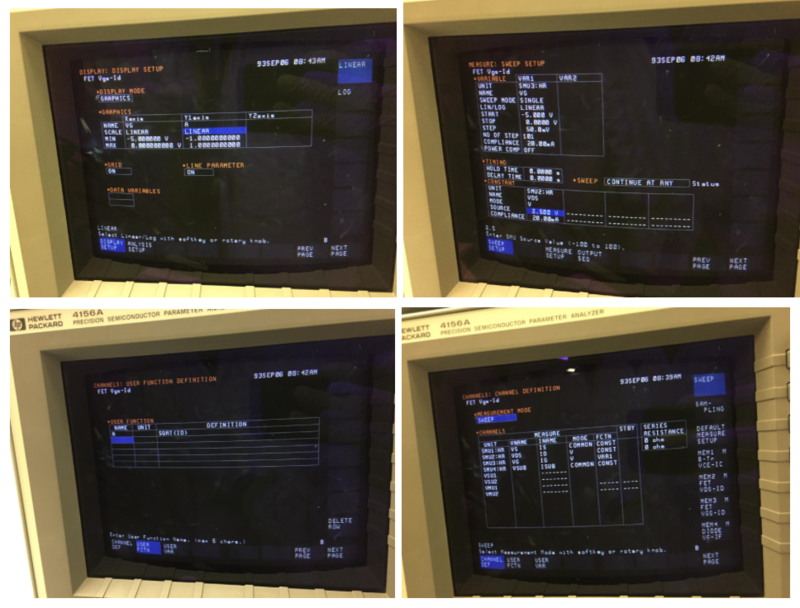 The Filmetrics system is used to measure oxide thickness. It works by measuring the phase shift between the light reflected off the silicon wafer and the light reflected off the oxide layer. 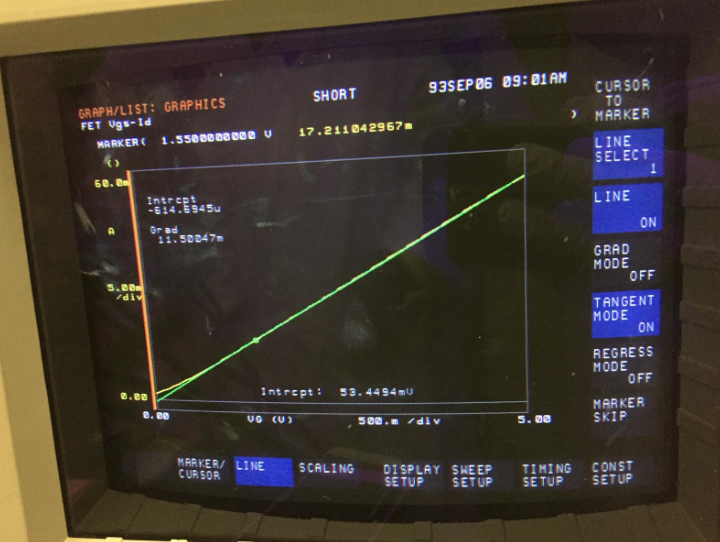 From the phase shift the program can calculate the thickness of the oxide film. Measurements are taken 4 separate times on a wafer and averaged. Initial calibration is done with the calibration Si wafer. One problem encounter during lab was during lithography the exposure camera lenses were out of focus so the knob need to be used to focus in on the right and left planes. 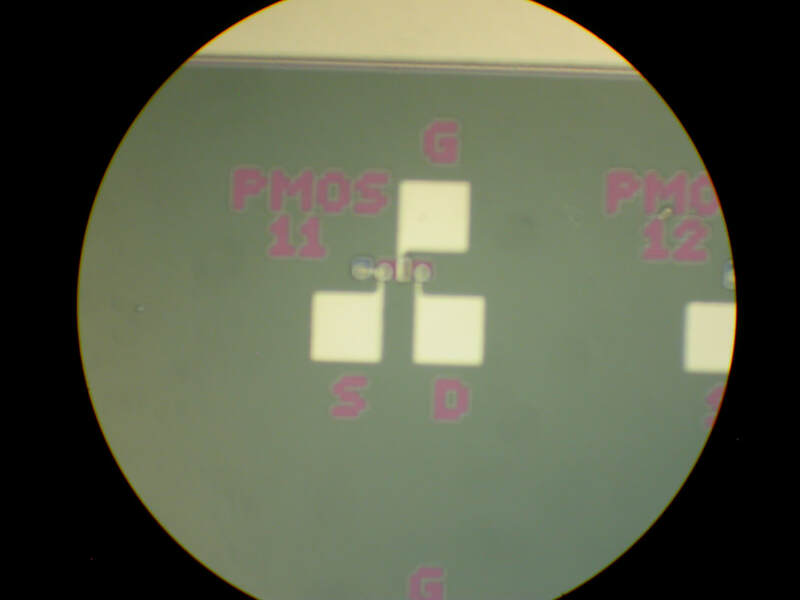 This just caused difficulty in aligning mask and wafer but wasn’t needed in any of the sections above. 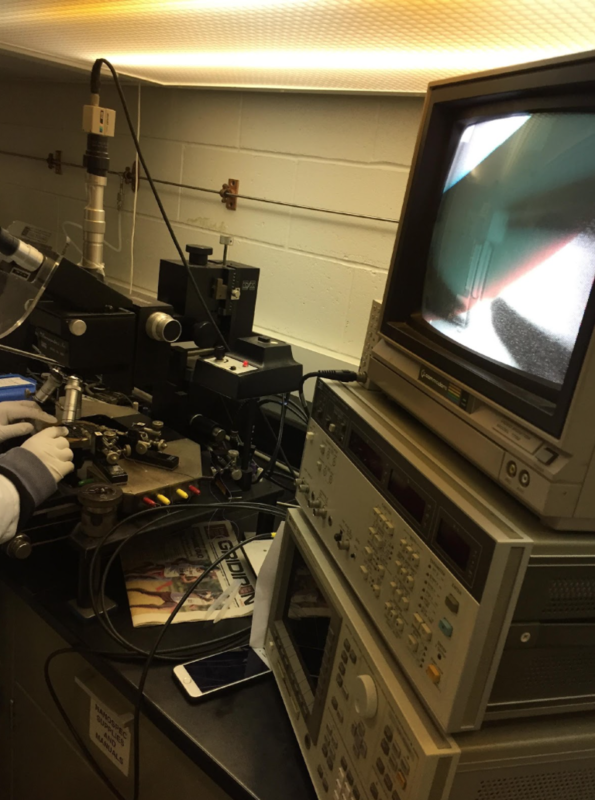 This process is aimed to deposit Aluminum by the electron-beam evaporator (EBE) and make metal contacts for devices. This was the last step of fabricating the CyMos. 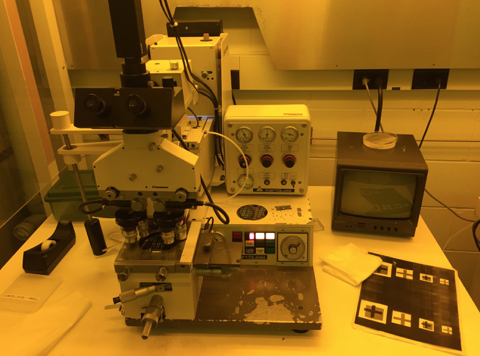 After a 6th level lithography and a PAN etching, Aluminum contacts were created. The electron beam evaporator (EBE) showed as following is used to coat wafer with Aluminum. A program should be set up before evaporation by the lab instructor and the evaporator will execute the program automatically. 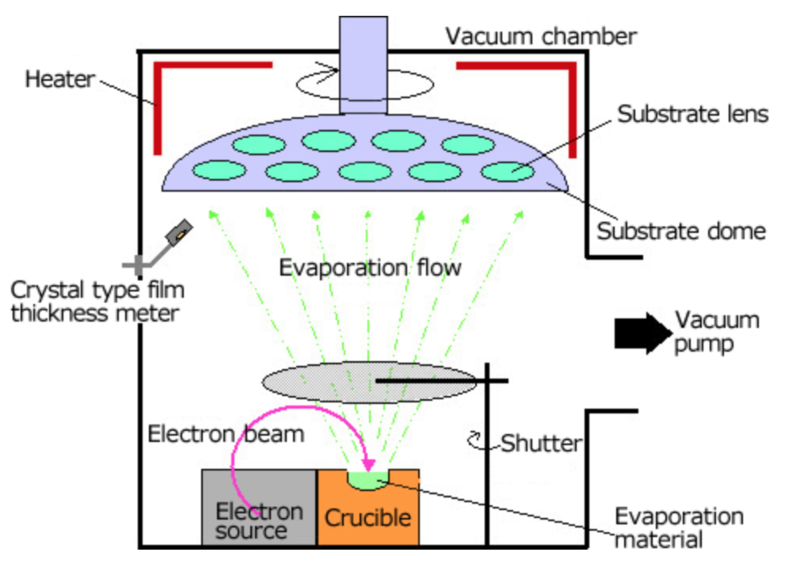 The evaporation process includes seven steps: (1) the chamber was vented using nitrogen so that it could be opened and the samples could be loaded into it; (2) After the lid of the chamber was closed, the mechanical pump evacuated the chamber to a pressure as low as 50 microTorr. 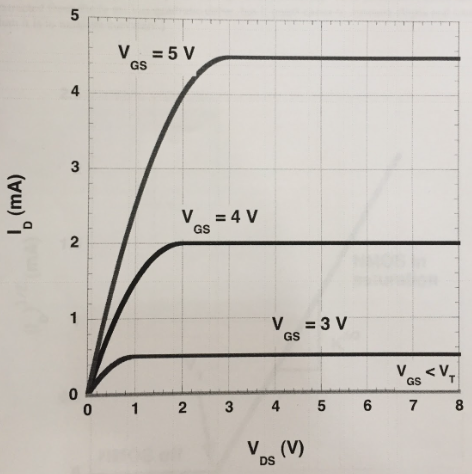 This was to create a working environment for the high ­vacuum pump; (3) Then the pressure of the chamber was pumped down by the high­ vacuum pump to 10­6 or 10­7 torr in 1~2 hours; (4) the power of the machine was increase gradually. In order to make Aluminum evaporate, the power needed was about 21% of the max power of the machine; (5) when the desired power was reached, the shutter over the crucible was opened to make the deposition occur. the readings on the front panel showed the thickness of the aluminum; (6) The shutter was closed after the desired thickness of aluminum was reached. 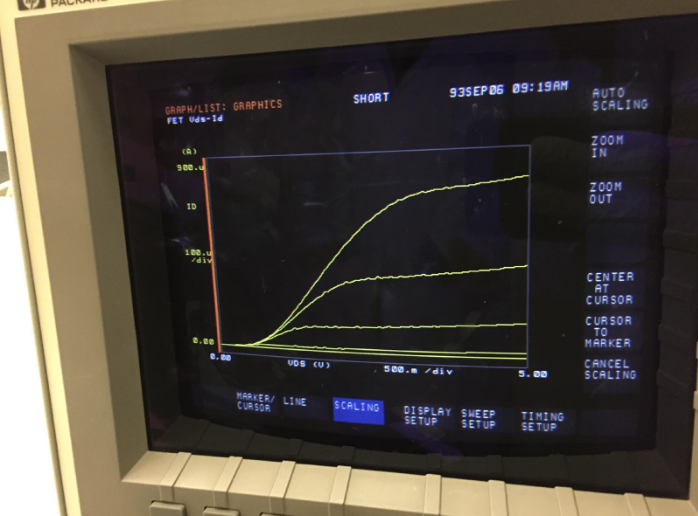 For our lab, it was about 300 nm. (7) the power was ramped down and the machine was finally vented so the sample could be taken out and new sample could be loaded. It is important that the machine is kept under high ­vacuum. Then PAN etching was used to etch off excess aluminum. A PAN solution was obtained by mix 80 ml H3PO4 + 80 ml CH3COOH + 20 ml HNO3 + 20 ml H2O. 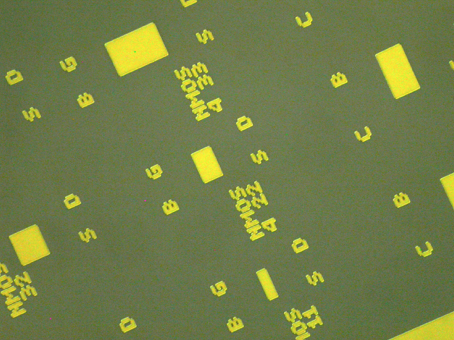 In order to save chemicals, one wafer was etched at a time. This added to the total etching time. The etching process was appreciable and therefore was easy to control. Below shows the different regions of the transistor based on gate source voltage and threshold voltage levels.